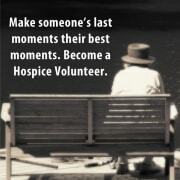 Encompass Health - Hospice is looking for dedicated and compassionate transition angel volunteers to be with patients and families during the dying process. A Transition Angel Volunteer is a presence, compassionate listener, still and quiet. They are an invited guest into a most sacred and personal transition. They understand that this transition is physical and spiritual and that each situation is unique. Transition Angel Volunteers go to patients when the time of death is near. Their primary concern is the comfort of the patient. Transition Angel Volunteers are a highly valued and vital part of our organization. You can use your gifts to impact someone in their last stage of life in many ways, and we will make sure you are well-trained, equipped, and supported. Transition Angel Volunteers will typically work in the background, nurturing as needed. The dying patient may or may not know the Transition Angel Volunteer is there...and yet...there you are....a constant observer, someone to comfort, to care and calm. "Fixers" and "Do-ers" will struggle with Transition Angel as so much of it is simply "Being". Transition Angel Volunteering is a beautiful experience. You don't have to do or be anything special...just be there. Embrace your compassionate self and know that this is always our patient's journey into death, but it is also your journey in experience.